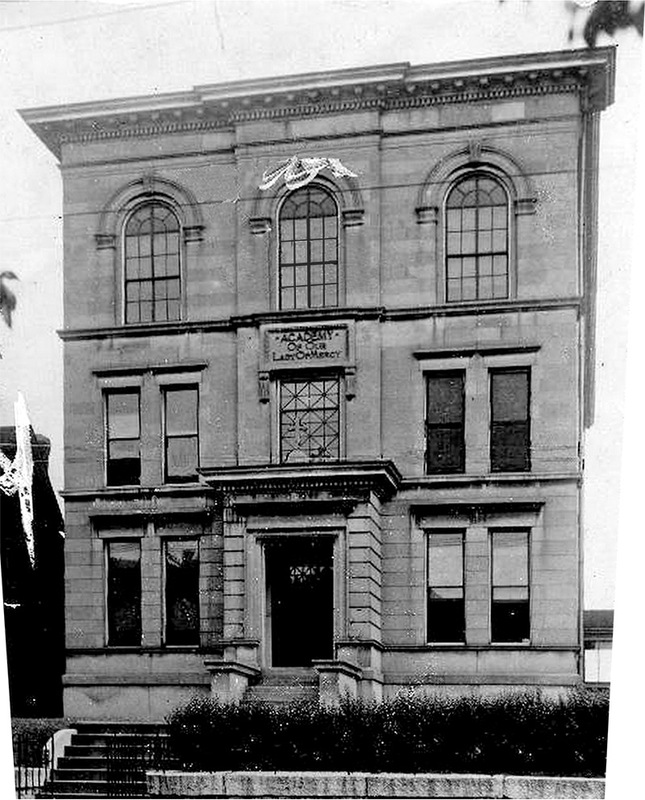 A stately stone-and-brick classroom building has stood watch over East Broadway for 114 years, but when it was built for the Sisters of Mercy in 1901, the structure was a relative newcomer to a proud German neighborhood growing on the outskirts of town. Known as Little Hamburg in the 19th century, today’s Original Highlands began to hit its stride in the 1870s with the opening of a new streetcar line extending down Baxter Avenue to Highland Avenue in 1871. That year, Cave Hill Cemetery was already a neighborhood landmark, looming over Broadway and Baxter for 23 years. According to the Encyclopedia of Louisville, the neighborhood was mostly built up by 1895—four years after the opening of Cherokee Park—with ornate Victorian mansions and sturdy shotgun houses. At the turn of the century, big building projects were getting under way. 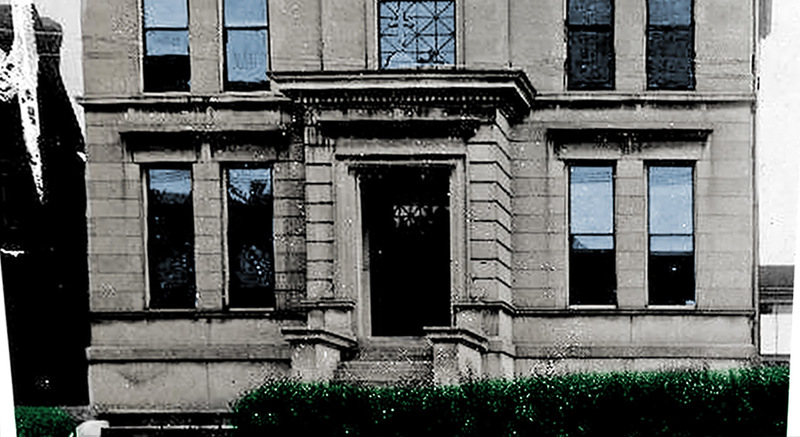 In 1901, the Sisters of Mercy built both St. Anthony’s Hospital (later Vencor and today Kindred) in addition to the classroom building for their Academy of Our Lady of Mercy, relocating some 100 students to a new suburban campus from an old site on Second Street. Later in 1916, the Louisville Normal School (today Breckinridge Metropolitan High School) was built down the street. As the school grew, its campus expanded, but in 2007, the school of 550 students had outgrown its Broadway location. That fall, Mercy Academy relocated to a new suburban campus off Fegenbush Road, and the Original Highlands site has since been vacant, vandalized, and with an uncertain future. Now, the neighborhood is in the midst of another transformation as new development is reshaping its built fabric. And the Mercy site is at the center of that change. According to a report in the Courier-Journal by Sheldon Shafer, Columbus, Ohio–based Edwards Communities, a division of the larger Edwards Companies, plans to raze the Mercy Academy complex and build 195 apartments on the 1.6-acre parcel and adjacent land next to a parking garage. The four-story, figure-eight-shaped complex, tentatively named Mercy Apartments, will cost $25 million and are intended to be upscale. Besides the original 1901 building, additional structures from roughly the 1950s through the 1990s would also be cleared. Together, those buildings contain around 80,000 square feet—the old classroom building comprising 20,000 square feet alone. 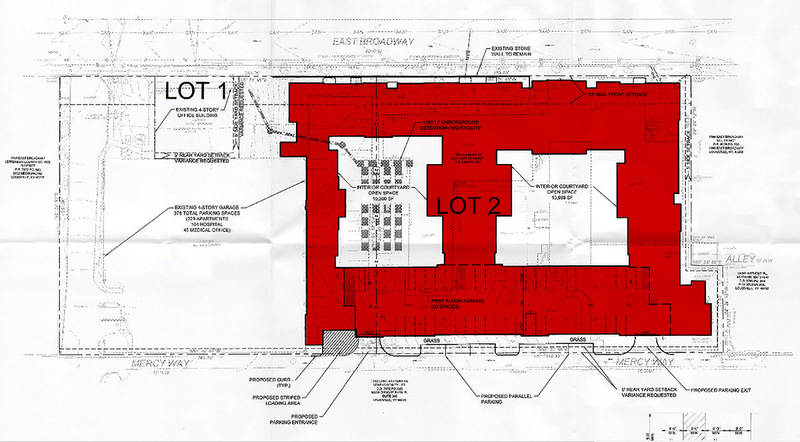 Edwards also purchased a parking garage directly west of the Mercy site from Kindred. Shafer reported that some of the garage will be used for the apartment building and the rest will be leased back to Kindred. Insider reported last March that the property was under contract, but plans are now just emerging. No design drawings have been filed with the city, but a site plan prepared by the Louisville office of Gresham Smith & Partners shows that the building will be built to the street, aligning with a small office building attached to the garage. 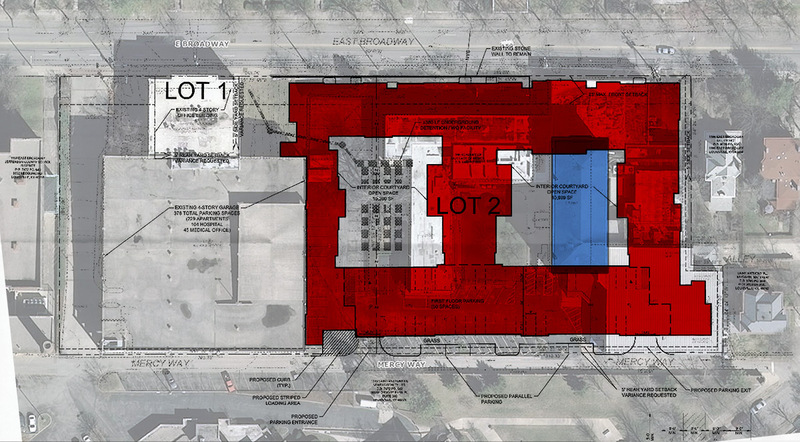 Along the back side of the building, 50 parking spaces are planned, accessed from an alley. Six parallel parking spots are also shown. Along East Broadway, the site plan indicates that an existing stone wall fronting the property will remain in place. Two interior courtyards, together comprising 21,000 square feet and including underground water retention infrastructure, are also shown. Representatives from Edwards Companies were unavailable for comment as of this publication and calls to the developer’s attorney, Bill Bardenwerper, were not returned. Shafer quoted Bardenwerper in his report, indicating that he saw no historic significance to the site. “All the buildings on the Mercy site will come down,” Bardenwerper told Shafer. “None can be as saved and none have been identified as important to save,”either from an architectural or a historic standpoint. Local architect and historian Steve Wiser told Broken Sidewalk that much of the historic quality of the building has been destroyed over the years. “My daughter went there and I’ve been in every square inch of the old building,” he said. The first floor of the stone facade was altered during a renovation in the 1980s, and interior detail was removed. The upper two floors of the 40-foot-tall, three-story building remain intact, however. “It would not qualify for preservation tax credits,” Wiser said, “which I think should be the primary criteria for any effort to save a structure.” He added that the building likely would fall short of local landmark requirements as well. Matt Blair, president of the Original Highlands Neighborhood Association, told Shafer Friday that he had not seen details of the plans yet, but said the neighborhood would likely be in favor of multi-family residential project like this. The proposal fits with the Neighborhood Plan’s guidelines. “Any proposed re-use of the Mercy Academy and Breckenridge [sic] Metropolitan High School campuses should be focused on condominium or mixed professional office/residential uses, and/or consistent with the uses allowed in their existing underlying zoning district,” the plan states. Blair added, however, that the neighborhood “would not want anything of importance to be torn down, for no reason.” The Original Highlands defeated a move several years ago to make the neighborhood a Landmarks district, meaning there will be limited public review of the demolition, but the site is located within a National Register district, meaning the area is “possessing a significant concentration, linkage, or continuity of sites, buildings, structures, or objects united by past events or aesthetically by plan or physical development,” according to Wikipedia. Neighborhood leaders were briefed on the design last night in a private meeting, and a public meeting is planned soon. Developers have filed for variances and waivers at the site, meaning the project will eventually go before the Board of Zoning Adjustments (BOZA). Those variances are minor, predominantly dealing with the height of the building and setbacks. The Edwards Companies previously built The Province, a luxury student housing development off Shipp Avenue near the University of Louisville. That project takes the form of a suburban gated complex, shying away from the street and the larger neighborhood in the area. A small art-deco building was demolished for that project. Most of the company’s other projects listed on its website are also suburban in form, but a couple examples, notably this five-story project in Denver by a local Denver architect, show that the company has built with an urban form in the past and can deliver a high-quality urban product. We’ll have an update when we can speak further with developers about the design for this project. Initial plans for a homeless shelter to be operated by Wayside Christian Mission emerged in 2008, but the neighborhood quickly organized a campaign to stop the project. Yard signs proclaiming “Mega-Shelters: Too big to be good for anyone” were a familiar site in the area. “We’re against a mega center. We’re against a Wal-Mart type shelter which could hold anywhere from 100, 500, 1000 people,” neighborhood resident and University of Louisville professor John Gilderbloom told WDRB at the time. “That would be a whole big impact on our neighborhood.” Wayside eventually canceled those plans and purchased a large hotel on Broadway in Downtown Louisville for its shelter. Later in 2013, another proposal was unveiled for the Louisville Center for Rehabilitative Medicine by a Massachusetts developer. The $8 million rehab center plan was approved by BOZA and would have included 36 short-term beds and 69 rehab beds in the existing building. The operator never received state certifications to run the facility and the project was cancelled in May 2014. At the time, Jackie Leslie, an officer with the neighborhood association expressed concern about the future of the property. “We are very concerned about what will happen to the property,” she told the Courier-Journal in 2014. This latest plan comes after the Mercy property has been listed for nearly a decade. Shafer reported that the developer hopes to begin construction in Summer 2016 and open in Spring 2017.